HALPERIN & SONS. Manuscript Letter Signed. 1 page + integral stampless address leaf. 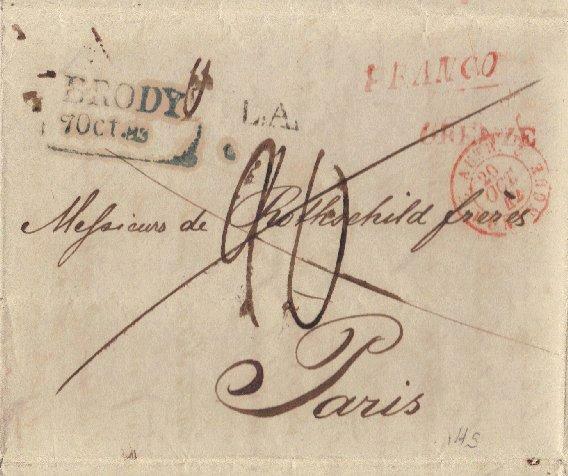 Berdytshceff [Berdichev, Tsarist Russia], with Brody and other postmarks, October 22/4, 1842. 9 x 10.5 inches. Horizontal and vertical folds; triangular cut and marginal tear on address leaf, not affecting text; some pencil and ink computations in margin; Good condition overall. French text. To Rothschild Freres, Paris. 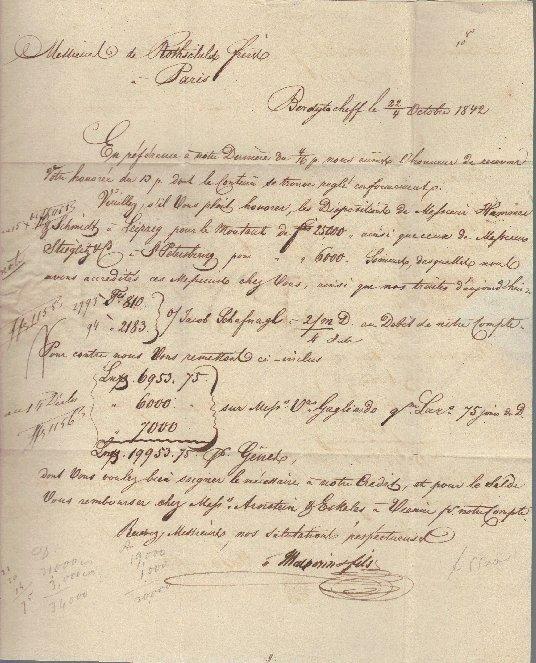 A business letter, apparently about large money transfers, mentioning Hammer & Schmidt of Leipzig; Stieglitz & Co., St. Petersburg (sometimes called the "Rothschilds of Russia", though they were German Jewish converts to Christianity); Jacob Schafnagl; Gagliardo Lazzaro; and Arnstein & Eskeles of Vienna (prominent Austrian-Jewish financiers, patrons of Mozart, whose descendants also converted to Christianity). The Halperins were not only the first prominent Jewish financiers of the Russian Ukraine in the early 19th century, but also the most influential lay supporters of Lubavitch Hassidic Judaism. The founder of the family fortune was YOSEF HALPERIN, who is mentioned in folktales about the famed Hassidic Rabbi Levi Yitzhak of Berdichev. He was succeeded by a son, who, according to different accounts, was named ISRAEL YAKOVLEVICH or YAAKOV YOSEF. (Perhaps there were two brothers, or one of these was a grandson?) 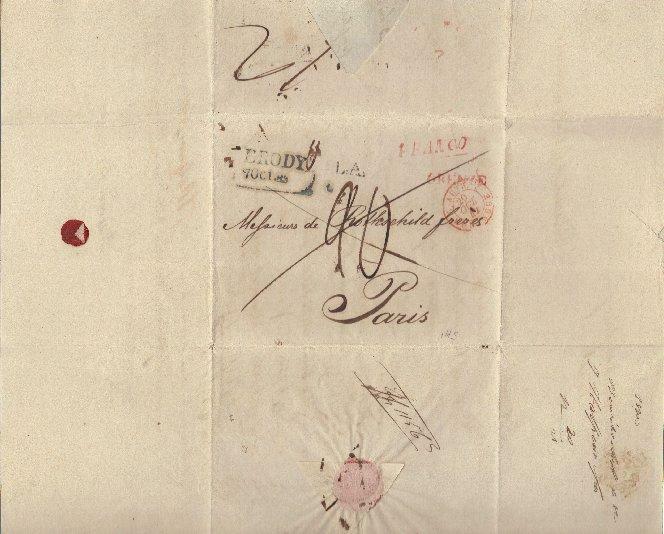 This letter seems to be signed with the initial "J", but it could also be a capital "I", and the Rothschild docketing note on the address leaf is also unclear. 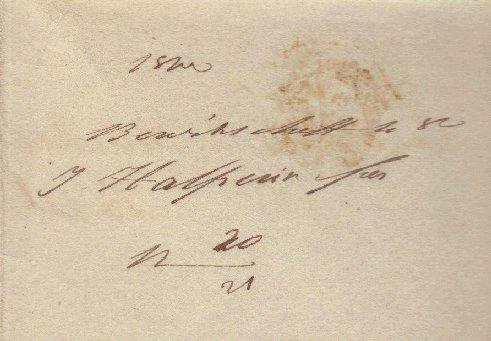 In any case, when this letter was written, Halperin of Berdichev was a wealthy financier who, unlike other Jewish bankers of the time, had remained true to his faith and was the influential leader of the Jewish community in the western Ukraine - so influential that when, in 1843, the Tsarist Russian Government sponsored a small conference of distinguished Jews in St. Petersburg to resolve the bitter dispute over the fate of Jewish education between the Lubavitch Hassidim and adherents of the "Jewish Enlightenment", Halperin was one of the five distinguished Jews present - and the only one who supported the views of Hassidic Rabbi MENAHEM MENDL SHNEERSON. Shneerson wished to win Russian Government approval to maintain traditional, private Jewish schools and Yeshivot, while the reformers favored state-sponsored Jewish schools where primary study of Talmud would be supplanted by reading more modern texts. That "reform" was probably favored by the Government, and the fact that the outcome of the conference was something of a compromise between the diametrically opposing positions may have owed a great deal to the political and economic clout of Halperin. 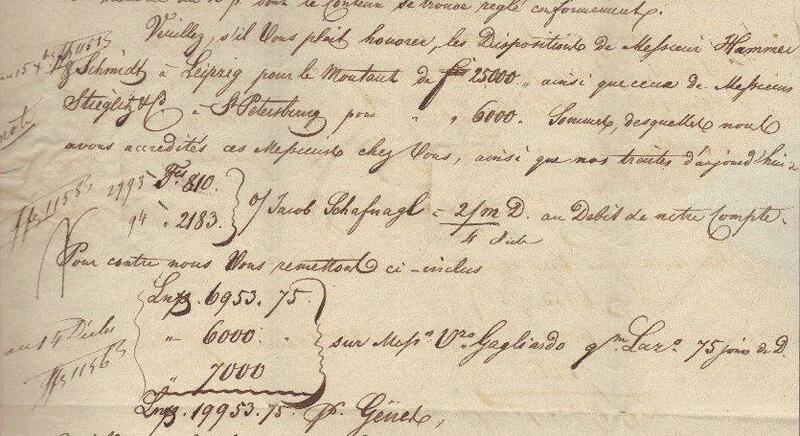 As this letter testifies, he had wide financial contacts throughout Europe which counter-balanced the claim of the reformers to a more "worldly" outlook than tradition-bound Hassidim. Halperin's stand cost him dearly. His anti-Hassidic opponents, having first attempted unsuccessfully to prevent his attendance at the conference by quietly discrediting him in the eyes of the authorities, went on to explicit denunciation which led to his financial ruin. He was ultimately locked away in a debtor's prison and his firm was dissolved.